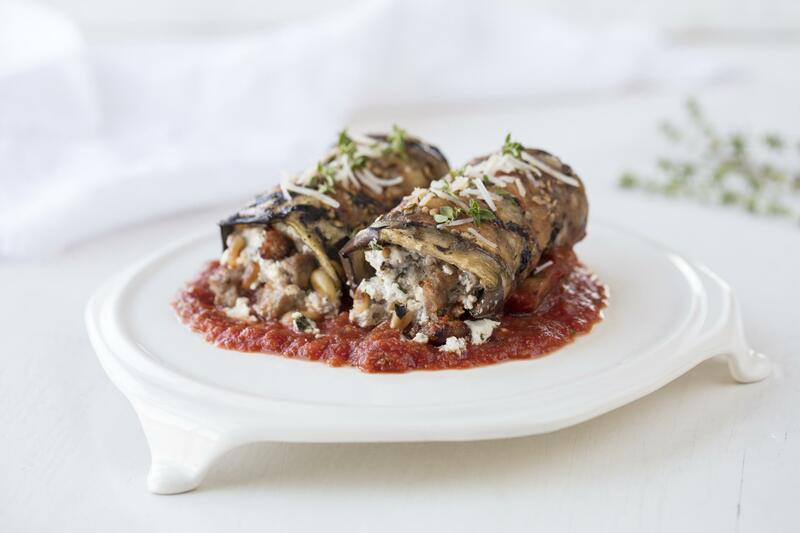 Perfect for a cozy, comforting dish on a cold night or a healthy weeknight meal, this Eggplant Rollatini gets an herbaceous, tangy kick from our Herbs de Humboldt® fresh goat cheese. Slice the eggplant lengthwise into 1/2-inch thick pieces. Season slices with salt and pepper. Grill eggplant slices on hot grill until lightly browned on each side and tender, about 2 minutes per side. Remove slices from the grill to cool. Mix Herbs de Humboldt with cooked spicy sausage, basil, pine nuts, and mozzarella. Place a tablespoon of the cheese mixture on one end of the eggplant and roll up tightly. Place the eggplant rollatini into an olive oil greased 9 x 9 inch baking dish, seam side down. Repeat with remaining eggplant. Evenly distribute the tomato sauce on top of the rollatini. Bake for 20 minutes. Garnish with basil.